Hey everyone! Today is the day for Mint Manis for Talia Joy! As I mentioned in Wednesday's post, I really wanted the nail community to join together to honor the life of Talia Joy Castellano. The idea for the mint mani theme is inspired by Talia's last Instagram posting, which was a mint manicure post featuring the hands of Talia, her mother, and her dear friend Tammy. The response to my request for this was nothing short of overwhelming. I am so grateful to everyone who wants to show their love and support for Talia Joy and her family. I started off with three coats of Mrs. Mint, followed with one coat of SV. For my thumb, shown above, I added two coats of Wet n' Wild Cost is No Issue. I used my dotting tools with Color Secrets Snow White for some randomly sized and placed dots. I then used my dotting tools again with Mrs. Mint and placed smaller dots over Snow White for some ocean bubbles. I chose this immediately for Talia's "just keep swimming". For my index finger, I added two coats of OPI Which is Witch. I then placed some silver studs along the top nail line to resemble a tiara, since Talia was most certainly a princess. 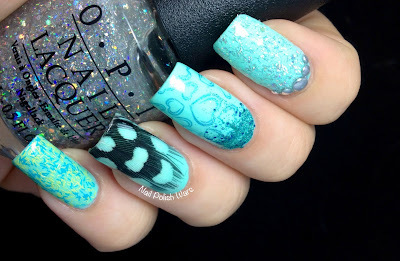 For my middle finger, I paired Color Club Over the Moon with Bundle Monster plate BM-317 for the heart design. 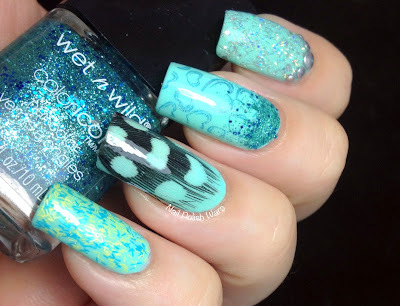 I then added a small glitter gradient to the top with Wet n' Wild Cost is No Issue. The hearts were inspired by all of Talia's "hand hearts". For my ring finger, I added one coat of SV and immediately placed a small black and white feather on my nail, and gently smoothed it out. I added another coat of SV over the feather, and, once it was dry, trimmed it down and filed it against my nail tip for a smooth edge. I chose the feather as an interpretive nod to all of Talia's adorable fur lined jackets and hats. For my pinky nail, I wanted a little pop of color, I added two coats of Sally Hansen Fuzz-Sea. I chose this for Talia's mentions of pops of color, and I thought it would make a nice, but not overpowering accent. I finished with one coat of SV. I honestly had no plan for this when I started it. My table was covered with nail art supplies, and several bottles of polish. I just kind of let the Talia inspirations do the talking, so to speak. I'm really happy with the mint skittle design because it's fun to look at and has a lot going on. Each nail was very much influenced by Talia, and that makes me smile. I really can't begin to thank everyone enough for joining in. I gave serious thought to making a video expressing my gratitude and sympathies for Talia's family, but I couldn't seem to make it more than five seconds without crying. It makes me overjoyed to see so many people come together this way for such a special person. 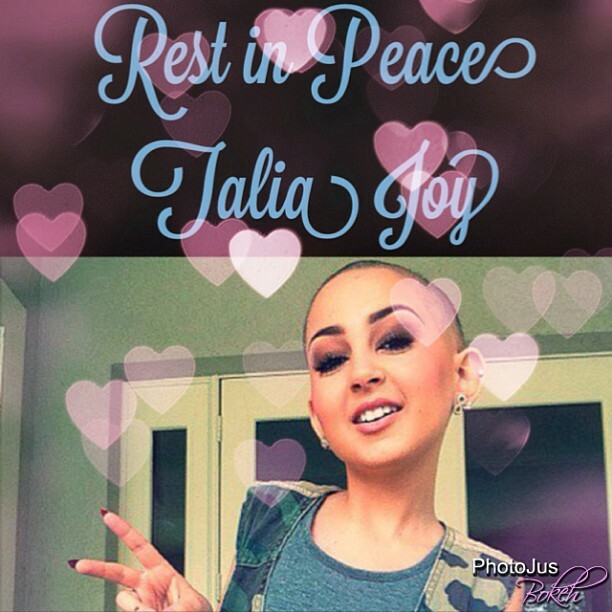 Check out the other blog links below for their show of support for Talia and her family! There is are also a hashtag circulating for this, which is #MintManisForTaliaJoy, so be sure to check out the other social media sites too - there have literally been thousands of Mint Mani postings! For anyone posting anything about Talia, her family has asked that we use the hashtag #TaliasLegacy as well. Grab the Inlinkz code for your blog here!! Beautiful mint skittle! Thank you for coordinating this! What a wonderful mint manicure in tribute to her. Thank you for arranging this, it is just beautiful to see the beauty community come together. Nicole thank you for organizing this day. I was more than happy to contribute my mani and I hope that Talia's family receives some comfort from all the love and support we all are sending their way. You and I had the same idea with the BM plate- I used the same design! I just immediately thought of hearts when I thought of Talia. 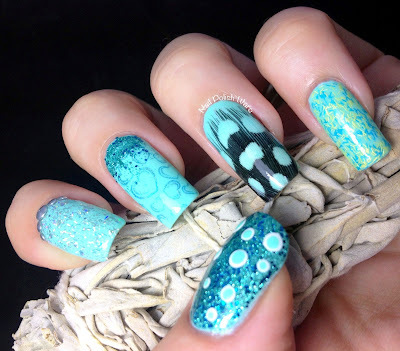 Fascinating nail art, and thanks for coordinating such a tribute! The manicure looks absolutely gorgeous! What a beautiful token of love!